This is both reality and dream. In reality, many parishes in collaboration with their parishioners and dioceses throughout the United States whole heartedly take up the call of what it means to be “catholic” and to welcome all. It is still a dream for others as they work to strengthen or build access. For still others, it is not a call from Christ that is yet realized in its fullness in their parishes. As a network of individuals, parishes, dioceses and organizations let us continue to do all that we can to work in collaboration with people with disabilities, their families and those who serve them in ministry to bring full access to the Catholic Church in the United States. Awareness is a critical need. Identify people with disabilities in your parish and get to know them. Learn about their gifts and invite them into parish leadership and service roles such as the parish council, choir, liturgical ministries, building commission, etc... In building relationships we strengthen our parish community. Ask your (arch)diocesan newspaper to include in every issue one article that can be written locally or pulled from the Catholic News Service (CNS) that features a positive story about a person with disability, awareness about faith and disability, or information about successful ministry with, of, or for persons with disability. Become aware of your diocesan disability ministry supports so you can access them yourself or become prepared to refer others to them, whom you connect with in the course of your parish life. 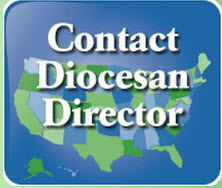 (Arch)Diocesan contacts are listed online, found by clicking on the image at right. Go to the National Catholic Partnership on Disability Ministry (NCPD) website www.ncpd.org and see the wide range of resources found there. When you become aware of a parishioner’s need or have a need yourself, reach out to these two important resources. Identified (arch)diocesan disability ministry and NCPD’s services were created to support people in parish ministry with and for those with disability. If you know of a couple in your parish or family who has received a poor prenatal diagnosis of a life-threatening condition or disability for their unborn child, reach out to them with encouragement and support. Tell them that you respect and admire their commitment to life and are willing to help in any way you can as they await the birth of their child. There are probably individuals in your parish who are right now struggling with cancer or other life-threatening conditions, themselves. Include them in your prayers. It is still a very supportive gesture to drop by with an occasional casserole or a pot of chili. Do little things that support people in those situations to know they are not alone in their state of crisis. Let us not only receive Communion with them at Mass but let us also become Eucharist for them, as we take the presence of Christ to their homes through acts of kindness and love based upon our calls to love one another and to be community in our parish family. If you know of children with a disability of some kind that seems to be preventing their parents from bring them forward for Sacramental preparation or religious education, speak to your parish catechetical leaders and pastor. They may not be aware of that family’s need. Let them know about the diocesan disability ministry and NCPD who they can count on for support in serving this family. We know that 20% of the members of a typical U.S. parish have disabling conditions of some kind. We know as well that disability is a normal part of the aging process. Let your awareness and sense of community with those having disability influence and create a transformation of the heart of your parish as it grows in awareness of people with disabilities, their gifts and needs. Editor’s Note: It was requested by parishes that NCPD write an article about beginning steps for parishes to take to start disability ministry, which they can use locally. Today’s article is the first in a series and looks at “beginning steps” from the perspective of the individual parishioner.